Can Astronauts See Stars From the Space Station? It is a common misconception that the Apollo astronauts didn’t see any stars. While stars don’t show up in the pictures from the Apollo missions, that’s because the camera exposures were set to allow for good images of the bright sunlit lunar surface, which included astronauts in bright white space suits and shiny spacecraft. Apollo astronauts reported they could see the brighter stars if they stood in the shadow of the Lunar Module, and also they saw stars while orbiting the far side of the Moon. Al Worden from Apollo 15 has said the sky was “awash with stars” in the view from the far side of the Moon that was not in daylight. Just like stargazers on Earth need dark skies to see stars, so too when you’re in space. 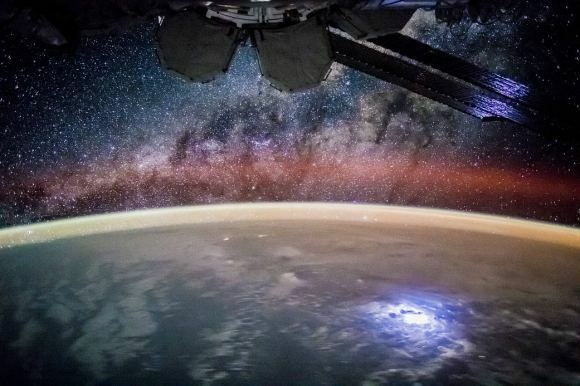 This long exposure image of the night sky over Earth was taken on August 9, 2015 by a member of the Expedition 44 crew on board the International Space Station. Credit: NASA. Universe Today’s Bob King has a good, detailed explanation of how astronauts on the ISS can see stars on his Astro Bob blog Astrophysicist . Brian Koberlein explains it on his blog, here. You can check out all the images that NASA astronauts take from the ISS on the “Astronaut Photography of Earth” site, and almost all the ISS astronauts and cosmonauts have social media accounts where they post pictures. Jack Fischer, currently on board, tweets great images and videos frequently here.